We have had some very unexpected but welcome surprises lately at the West Coast Wildlife Centre with the arrival of some Haast tokoeka chicks! 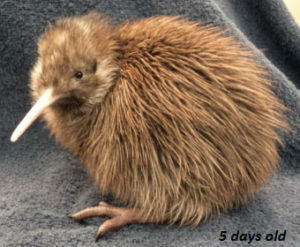 With the Department of Conservation managinga large ‘Battle for our Birds’ predator control operation in theHaast Kiwi Sanctuary this season, we were not expecting to raise any of this interesting subspecies of kiwi through the captive facility this season. All of the amazing work from Doc in the forest has significantly dropped the numbers of stoats running around in the Sanctuary, which means it is much safer for a baby kiwi chick out there! All Haast tokoeka eggs were going to be hatched in the wild this season in their natural nests, monitored very closely with cameras and radio transmitters so we can learn the most information possible during this unique situation. But one of the interesting things about the Haast kiwi population is that they are in two quite separate groups! So we have incubated two Haast tokoeka eggs from a population that is up the Arawhata River, and so outside of the Stoat control area. We are also expecting a wild hatched Haast chick to arrive soon into our Quarantine ICU room. This chick was rescued from the sanctuary with a large swelling under its eye so has received surgery and treatment to its tearduct at Massey University. Now that it has recovered, we will look after the chick at the West Coast Wildlife Centre before sending it off on to the next stage of the Operation Nest Egg journey, a Kiwi Crèche at Orokonui ecosanctuary in Dunedin. We love looking after Haast tokoeka chicks! They have very long thick feathers and very strong personalities. Our Kiwi rangers are currently swooning over a new Haast chick that has gorgeous white feathers down either side of its face, like mutton chop sideburns, and on its belly. I dare you to look at the photos to the right and not say‘oooowwwww!’ Haast chicks are also notoriously feisty sodefinitely benefit from a hands off approach to captive management, the less interaction the better for healthy growth and development. Come in for a Backstage Pass tour to check out the young Rowi and Haast chicks onsite at the moment! Previous Previous post: HELLO AND GOODBYE!